As a home cook, you expect things to not work out from time to time, but you learn from it. My lamb salami cured perfectly, and it has a great flavor from the red wine and fennel used in the cure, but I'm disappointed in it. And honestly, it's my fault. I just got too excited to try out a new toy. In my initial post, I mentioned carefully trimming all the fat off the lamb, as I did not believe lamb fat would cure evenly, and most likely go rancid. I also expressed my excitement to use my new meat grinder plates, to give a coarse, rustic look to the salami. Not weighing these two factors together caused my salami to turn out dry and rock-hard. When you make pork salami, you've got an inherently fatty meat, streaked with small amounts of intramuscular fat. So in a normal pork salami, you've got your meat, which has a small amount of fat embedded in the structure, along with small bits of back fat adding extra richness. With lamb, I trimmed off all the fat, which made the meat even leaner than it already was. Rather than use a fine grind of fat to evenly spread the fat throughout the lean meat, I used the new coarse grind plate to make large cubes of fat scattered throughout. So as that mixture cured, the meat nearly completely dried out, as it had no intramuscular fat to add any softness or "cushion" as you chew. The result is a salami that's 70% rock-hard meat, with 30% cubes of soft, luscious pork back fat scattered throughout. Now, if I had used my old, smaller grinder plates, it would have evenly spread the fat through the meat, creating a much more even texture. In retrospect, the combination should have spelled disaster to me right away. But hind-sight is always 20/20. The sad part is that the spices and flavor are really great, but don't help to correct the major textural faults of the finished product. 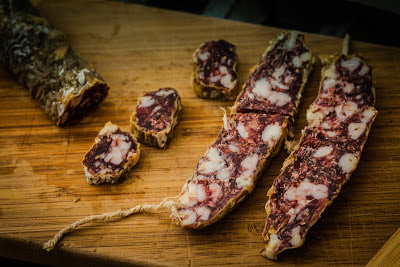 I think I'll make this salami again next fall, but I'll be sure to grind it much more finely for a smoother texture.